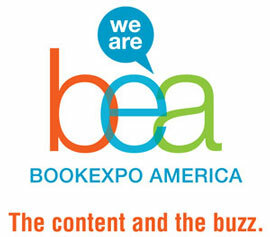 Yesterday’s opening Keynote Panel at BookExpo America 2013, “The Future of the Book,” once again set the tone for this year’s book fair. Moderated by John Ingram, CEO and Chairman of Ingram Content Group, the talk served up Steve Bercu, Co-owner of the independent bookstore Book People in Austin TX; Jane Friedman, CEO and Co-Founder of Open Road Integrated Media; Barbara Marcus, President and Publisher of Random House Children’s Books; and Michael Pietsch, CEO of Hachette Book Group. Barbara Marcus sees that with digital, there’s still room for improvement insofar as pulling all readers into the landscape. Digital illustration books for kids aren’t quite there yet, she said. Her job is to hook kids into solid content (she’s got the lovely Harry Potter feather in her cap), and to find ways to expand the brands, whether with puzzles, games, or other merch. While Friedman believes there’s definitely a place in the realm of ebooks for illustrated titles, Marcus, whose genre this is, struggles with the print-to-ebook translation and hopes that innovation is on the horizon. Self-publishing is naturally a topic that will find some airspace through the conference, and panelists know it’s more relevant than ever. The expectations of self-publishing are shifting; the quality is going to level out, though everyone claims to know that there are some wonderful self-published books out there. Oh, and erotica. It’s not like it once was with Vanity presses, where people assumed the materials weren’t high quality enough to pick up publishers. The quality of self-published books will “find their level and plateau,” assured Friedman. “When I first launched audio books in the 1980s, everyone was concerned that it was going to take away market share from books.” Instead, she explained that it dovetailed nicely with print and enhanced sales rather than tapped down sales. Social Media is enhancing the reach of publishers to their coveted readers, and Pietsch pointed out that what readers want now is less communication with the publisher and more communication with the author. This, of course, poses more work for authors, and the marketing folk need to be on deck to help them learn to communicate their brands and retain a sense of authenticity (a huge theme to emerge from our own Reaching Readers Conference on Tuesday). Authors need to learn the complexities of the business and realize that they’re not going to be working with just the editor anymore, but rather the whole team of PR, Social Media, etc. Bookseller Steve Bercu beats the ‘Build-Community-Drum like a Super Rock Star.’ “You have to make people want to come your store,” he said. He’s finding very innovative ways to pack his stores with new customers. In one of his community outreach case studies he discussed a new partnership with teachers across Austin to create learning modules whereby they’ll purchase a new book from him, about Africa. “That’s an awful lot of 3rd, 4th, and 5th graders who have parents, teachers, and grandparents with purchasing power.” He’s also happy to host self-published authors in his store, though his expectations of them are that they come as prepared to engage the community as traditionally published authors—in other words, please show up with a pile of one sheets about your book that will help booksellers make the case to customers. Hachette’s Pietsch, who was only promoted into his role fairly recently, spoke with Ingram about what it’s like to inherit a legacy whose marketing machinations have been firmly in place. He made the compelling point that 75% of the books that are sold today are still published between physical covers. This means he can work within the framework of his pre-existing marketing strategies, while still moving the company forward to offer as many types of platforms as are in demand. Heed their collective call: It’s the responsibility of publishers to provide content whichever way readers want to take it. Ladies and gentleman, let the games begin.